Your wedding anniversary is a time to celebrate your love from the day you were married ‘till now. Any special photos taken on your wedding day or any happy moment during your marriage can be subsurface engraved into beautiful optical crystal gifts. THE THIRD YEAR WEDDING ANNIVERSARY AND THE FIFTEENTH YEAR ANNIVERSARY ARE THE CRYSTAL ANNIVERSARY YEARS. Once your wedding photo is subsurface engraved, the special moment is immortalized forever. The crystal anniversary gifts will never yellow or fade. The image will sparkle in the light and warm hearts for generations to come. We enhance your photo to make it look as spectacular as possible in the crystal. Every photo is carefully edited to create the best possible engraving. Available 2D to 3D photo conversion services will turn your flat 2D photo into a sculpted, life-like 3-dimensional image with depth. The dazzling subsurface engraving inside of the crystal will sparkle in the light from our available high quality light base or your own light source. Scroll down to see some examples of our anniversary crystals. 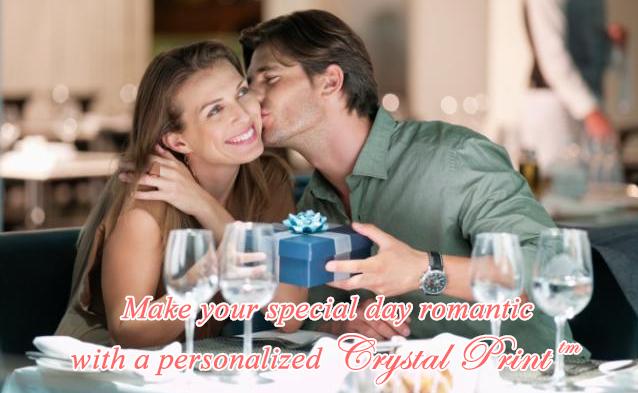 Any of our crystal pieces can be engraved with your special anniversary moment or message. Just select your favorite shape, upload your photo and order now. You won't be disappointed.